Storytelling is a timeless skill. Stories have kept humans alive since time began. Mankind’s most important lessons were passed on from generations through different mediums. History took its form through woven experiences of men. Battles were won through great men inspiring armies with tales of bravery and strength. It was storytelling that separated the good from the great. In business, storytelling has the power to link a brand to its consumers. A well-written content can help brands create awareness, build loyalty among its customers and generate sales. Herlene Somook fully understands the importance of storytelling. As a writer and content strategist, she makes sure that brands communicate their story clearly to their target market. She helps them create compelling content that people can easily digest and remember. She also runs a freelance agency called Creative Labs, which offers online solutions to brands and businesses through content marketing, graphic design, customer service, and telemarketing. 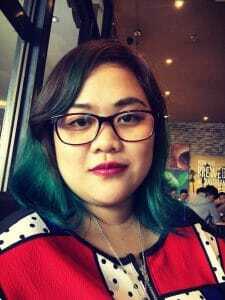 Check out our interview with NextStep’s Head Writer, Content Strategist, and Storyteller, Herlene Somook. I play a number of roles, but primarily I’m a storyteller. As a creative entrepreneur, I help people, brands, and businesses tell their stories through content marketing and social media management. I also manage a freelance agency along with a partner, and we provide online solutions and services to several international brands. Freelancing isn’t a new concept in our home. My father was a freelance graphic designer who worked from home and my mom was a homemaker. So I grew up with both parents always around. I knew I wanted my kid to have the same kind of childhood I had but I didn’t know how to make it happen. Before freelancing, I was a Kumon teacher for three years and a call center representative for five. My husband and I worked for an international IT company, and we were both paid well. But I wasn’t happy with the work I was doing, so I decided to call it quits and take care of my kid. I also went through some kind of quarter life crisis and found myself asking what I really wanted to do. It was a difficult time for me because I felt like I was going nowhere in my life. I tried going back to teaching but soon discovered that it wasn’t my passion. I also tried baking and selling food, but found the market too saturated and difficult to sell. Until one day, a friend contacted me for an opportunity to work online. The rest, as they say, is history. I absolutely love the freedom freelancing offers. It took me a while to realize that I’m a business owner and no longer an employee. But now that I do, I’ve learned to take control of my actions and the direction I take as a business owner. Freelancing also has a way of redefining your mindset and how you see opportunities around you. It gave me the chance to do what I love and find purpose in what I do. I think the biggest challenge for every freelancer is the mindset shift. Most freelancers come from the corporate world where everything is defined and organized into categories and cubicles. On the other hand, freelancing requires you to think outside the box and let go of the employee mindset. It also requires you to assess yourself and your skills fairly so you could settle the right price for your services. Another challenge, especially for moms like me, is time management. I quickly learned how to prioritize tasks and activities that matter to my family and work. I also quickly learned that there is no such thing as work-life balance and that getting to your goals means discipline and sacrifice. Once you accept that, everything else becomes easier. I try as much as possible to face my fears head on. Most of us experience analysis paralysis, and this stops us from doing what needs to be done. I’ve learned to take control of this and just do what I can. I’m also very experimental with my approach at learning. I pretty much learn by doing and make adjustments along the way. I think the biggest challenge for freelancers is the mindset. Whether you’re a newcomer or a seasoned freelancer, it is best to come into freelancing prepared with a vision and the mindset of a business owner. Freelancing is a big trend in the Philippines today. And when it’s a trend, most people go into it like it’s just easy money. I see a lot of newcomers on groups wanting to start, but when you ask them to do something and take action, they come with a lot of excuses. Some also see freelancing as a side business and not a full-time career option. Most seasoned freelancers are right when they say that freelancing is a bit romanticized, and that leads to some thinking that it’s a walk in the park. But in reality, it’s not. There are a lot of sacrifices you have to make to succeed in this, just like any other job. The difference is, you get more control of what you want to do and who you want to do it with it. Tim Ferris’ The Four Hour Work Week taught me so much about the freelancing mindset. Another book is Tina Fey’s Bossypants, which has come in handy with how I manage people in my team. Filipinos are quick to adapt and embrace technology. We also have a great command of the English language. The BPO industry has also exposed most of us to a global mindset and helped us to transition into freelancing easier. The skills, processes and the discipline that we learned from call centers helped us a lot. It also exposed us to different cultures and gave us a better understanding of how to work with others in the process. Never stop learning and growing your skills. At the same time, grow and nurture your network. But I think what matters most is execution. You can have tons of good ideas, but without action, it will all go down the drain. You must also learn how to market your skills and yourself. Get out there and promote your skills because no one is going to hire you if they don’t know about you. Optimize your profiles, know your market, and don’t be afraid to ask the right questions. You also have to face your fears and learn from failures. You can always get the chance to do things over if you open yourself to the things you are afraid of. Most of the opportunities I have right now is because I said yes and found a way to make it work. Connect with Herlene on LinkedIn or shoot her an email at creativelabsph@gmail.com.